You've been saving your pennies, being frugal as can be, waiting for a buying opportunity in this depressed economy. Sotheby's auction in New York. "American Paintings, Drawings & Sculpture"
Cassius Marcellus Coolidge. The Poker Game. Cassius Marcellus Coolidge was well-known in the Rochester area of New York for his paintings of anthropomorphised canines surrounded by the trappings of successful middle-class life. Typical subjects included the all-night card game, a trip to the ball park, commuting to work and even arguing a case in court. A great deal of attention is paid to the dogs' clothing, details of their surroundings and to a humorous variety of facial expressions. 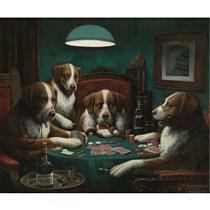 Cigar companies, the artist's first customers, printed copies of his paintings for promotional give-aways, but the printers Brown & Bigelow made Coolidge's dog-genre familiar to the general public as advertising posters, calendars and prints.